Our walk of Saturday 17 October 2015 takes place on Madari mountain. 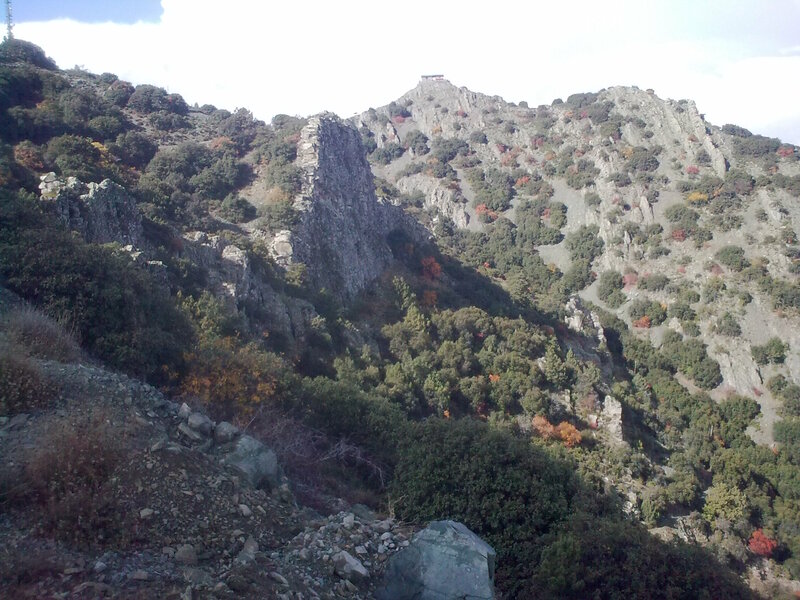 Madari is located east of Troodos, in the Pitsilia area. The most prominent of the Pitsilia group of villages are Agros and Kyperounda. Madari is covered by a variety of pine trees, junipers, cedars and fir trees, and also presents the majestic golden oak, an endemic species to Cyprus, as well as a rich variety of bushes and wild flowers. The walk starts at 11:15 am. Xenophon is leading this walk, which will go ahead even in light rain; if you need to, call 97613720. The starting point for this walk is outside the gate of the CYTA station atop Madari. The Teisia tis Madaris trail is a circular trail, at an altitude close to 1600 m. The walk will take about 2 hours and is of medium difficulty, with several downhill and uphill sections. The total distance is about 5 km. The walk covers an area very rich in vegetation, primarily junipers and golden oaks. The walk will take us to some upright structures, resembling walls; yet these are walls not built by human hands; instead, they resulted from the molten magma which rose from deep inside the Earth, in ancient geological times! A truly rare geological sight. The Greek word for walls is ‘teisia’, hence the name of this trail. We shall combine the Teisia tis Madaris trail with a short, albeit demanding climb, 15 minutes from start, to a Watch Tower (Pyrofylakio) used by the Forestry department. From the Watch Tower we shall enjoy some magnificent 360° panoramic views. Because we shall come back from the Watch Tower the way we climbed, this part of the hike is optional. If you prefer, you may choose to stay behind and explore the Madari scenery. The trail will offer us several more exciting views. At the end of the walk we shall sit down for lunch at a taverna in the area.